One of the greatest benefits to living in my apartment is the trash process. When the garbage is full, I take the bag to the tiny room down the hall, open the hatch and throw the bag down the chute. And it’s gone. Just like that. I can do this any day of the week, any time of the day. Sometimes, I do it in my pajamas – that’s right. In my pajamas. Recently I was upstate at a friend’s country home. It’s an amazing 1830’s Federal Style home on a big piece of property with nature all around – it’s for sale, I can send you the details. The home is so inviting, in fact, that a giant skunk found its way into one of the window wells and decided to take a nap there…Once we discovered the snoozing skunk, we did what any good Manhattanites would do…we called the police. The officer who arrived kindly confirmed that it was, indeed, a skunk. And that there was nothing he could do to move it. Fortunately for us, country skunk made its own way out of the window well without spraying and well before morning. Since my friend’s home is for sale, I thought we might want to do an emergency Pantry Raid: go through the kitchen and toss any food items that were expired. Then, we had to strategerize how to throw all the expired food away. See, trash pick up is once a week up there…and, on Thursdays. We were leaving on Sunday. It’s still pretty hot right now..even upstate. I think you understand the challenge. We couldn’t leave two large garbage bags of post-expiry perishables in a hot bag, in a hot trash bin, in a skunk infested land for a week…uhm gross. Much brainstorming and 3 phone calls later, we found a neighbor willing to come by and take everything out Wednesday night. Another reminder that living in tiny spaces in NYC, has its benefits. Regardless of how it happens, I hate throwing away food. As Melissa D’Arabian constantly reminds us: the most expensive ingredients are the ones you throw away. In my house growing up, expiration dates were just directional information. If cheese or bread had mold, we cut the mold off – ‘It’s penicillin’ my mother would say. Or, ‘stale bread is halfway to toast’. And I turned out OK. I mean, right? 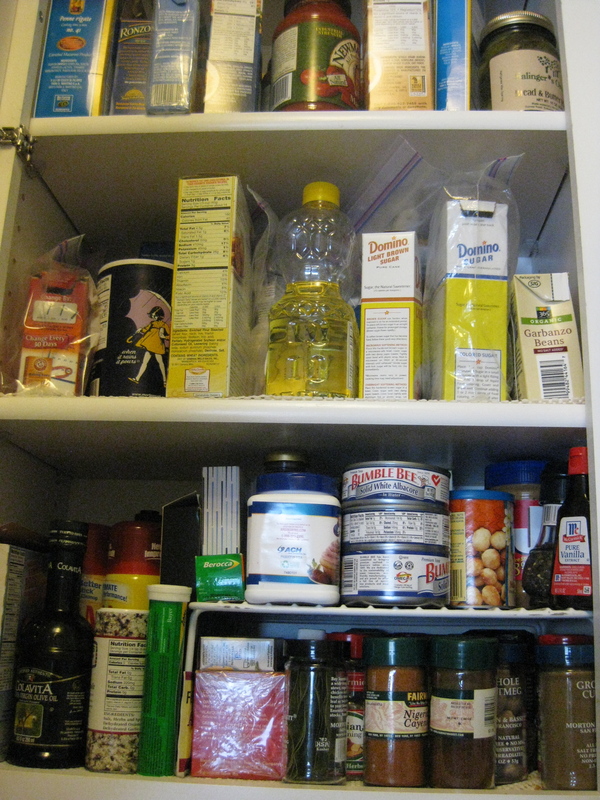 But, I’m not partial to eating penicillin and I’m a little nuts about going through my ‘pantry’. And determining what is in danger of expiring and creating from there. More of a pity than a pantry…but it’s NYC. 1. 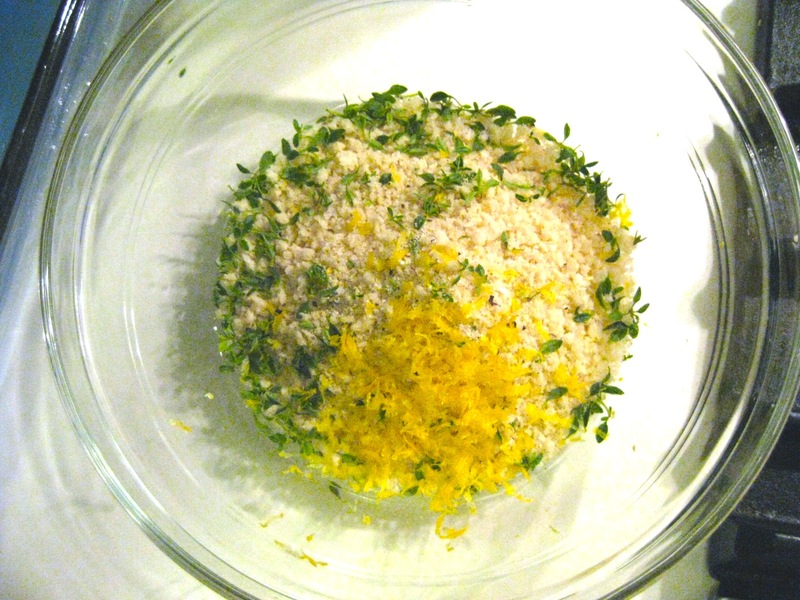 In a bowl combine 1 cup Panko bread crumbs, 1 tbsp Lemon Zest, 1 tsp Lemon Thyme, 1tsp Krazy Mixed Up Salt and 2 tbsp of melted butter. 2. In a second bowl, whisk one egg white until well frothed – do this by hand to build your arm strength. NOTE: You can, apparently, freeze the unused yolk.., but I think that’s sort of gross and would opt to keep the yolk in the fridge overnight and jack up an omelet with an extra yolk in the morning. 4. 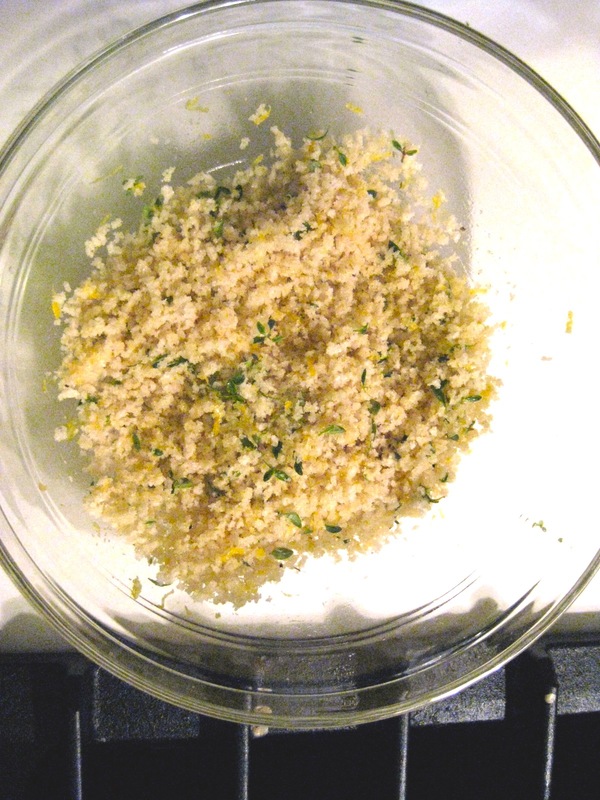 Put the egg white-d filet into the Panko mix and coat well. 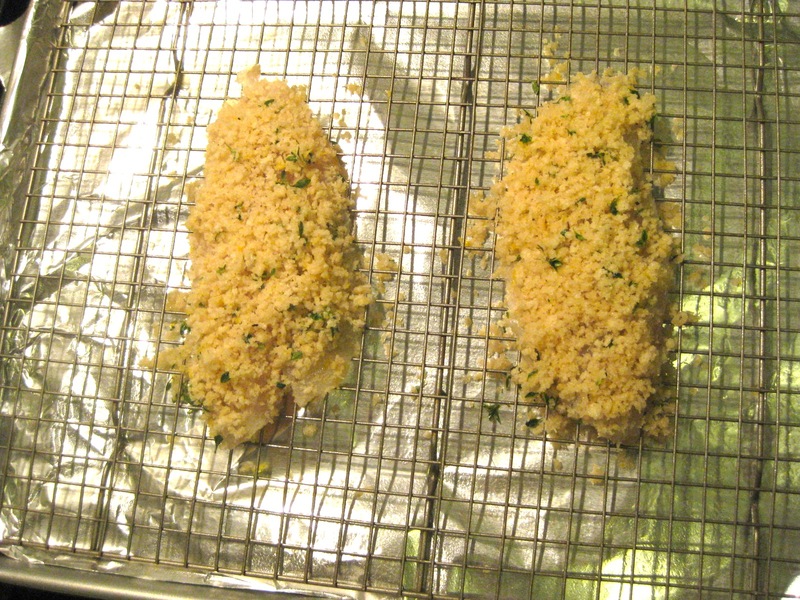 If the panko isn’t adhering well, there’s no shame in gently pressing more of the breading onto the top of the fish. 5. 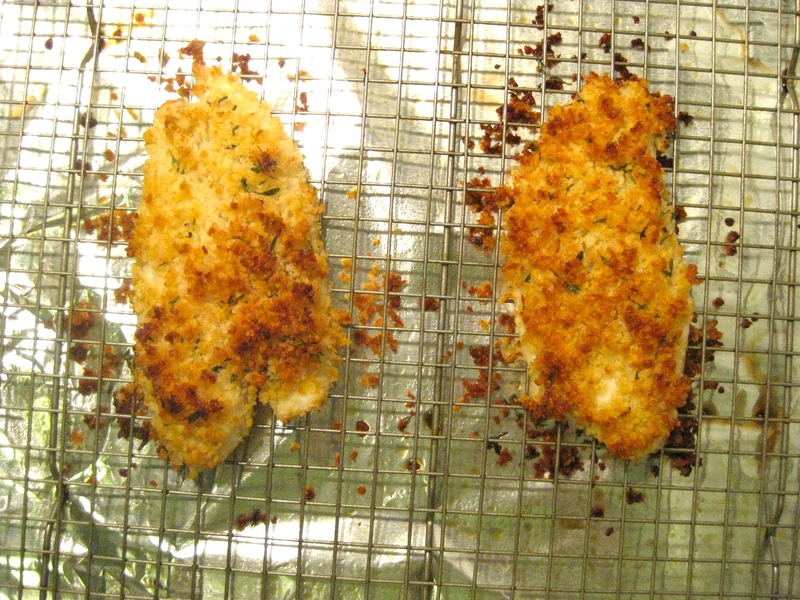 Transfer the breaded fish to the prepared rimmed baking tray. Using the rack helps the fish to cook evenly…or so it’s said. I lined the baking dish with aluminum foil for easier clean up. That’s it. I served it with roasted asparagus and parmesan cous-cous. While penicillin is derived from mold that develops on grains – I’m not really sure if the particular mold that developed on our bread or cheese from childhood really had penicillin benefits of any kind. And, I’m not sure eating just the ‘good parts’ is really a good idea. And…even though trash disposal from my apartment is simple…throwing out unused, past expiration date food is expensive. Best to avoid the penicillin predicament and do frequent Pantry Raids: check expiration dates on your food stock and cook from there. First use: pull the leaves of 5 or 6 stems and place in small bowl in kitchen to surround yourself with fresh and bright lemon aroma while cooking. Second: pull the leaves off of all of the stems. Reserve one tbsp…put the rest in a ziploc bag in the freezer for later use. 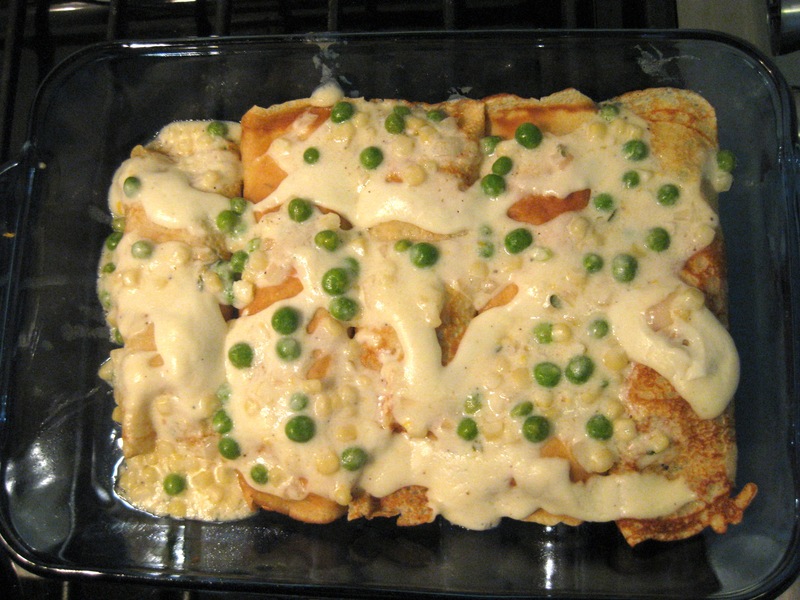 With the tbsp: use to layer lemony flavor into lemony shrimp crepes. 5. 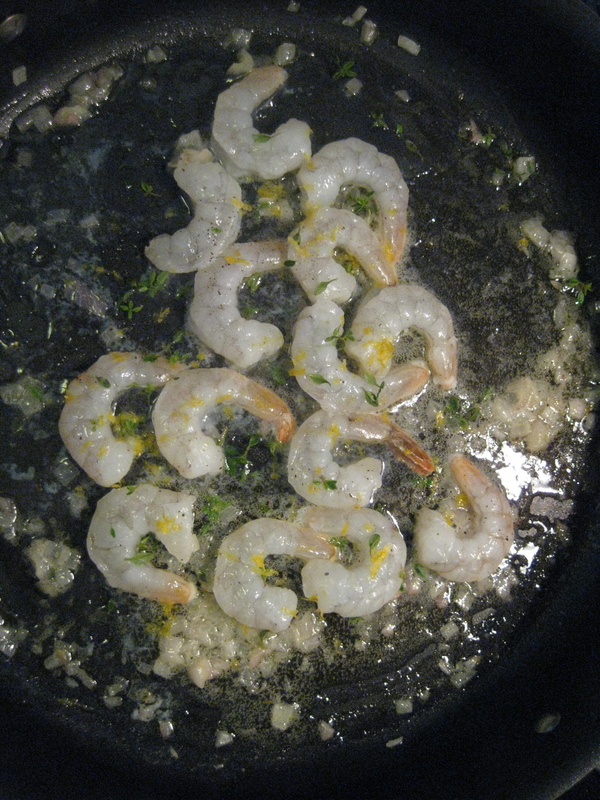 The shrimps will only take a couple of minutes per side to cook …so be quick here…Add 1/2 cup of dry rose wine. 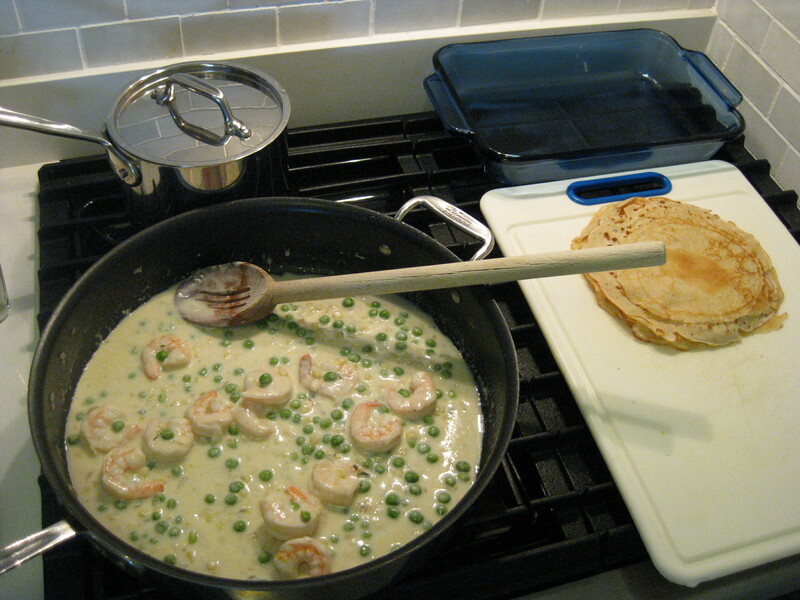 You can add a dry white wine…but since shrimps are pink when cooked, I thought a pink wine would be prettier. Plus the pinot grapes in a rose add a good deal of flavor. 6. Turn the heat up and allow some of the wine to evaporate. 7. 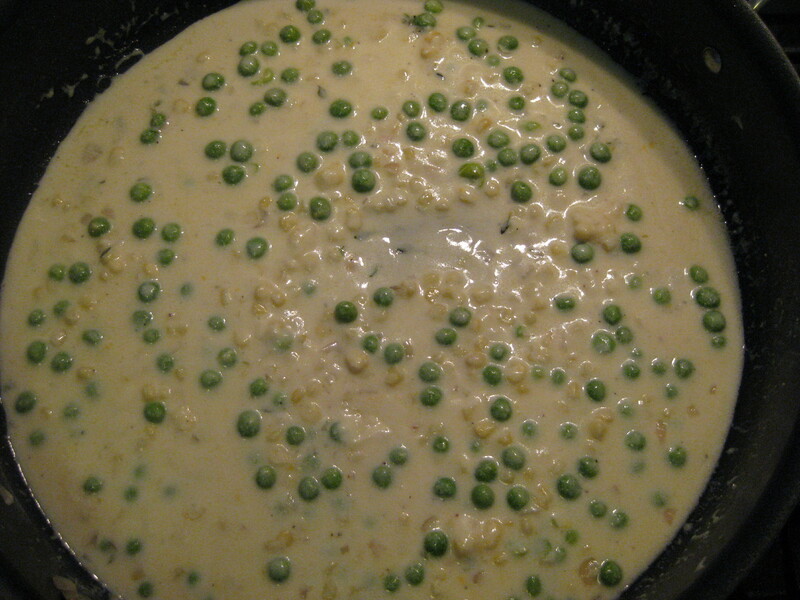 Turn heat to low and stir in 1 – 1/2 cups of mornay sauce with peas and corn. 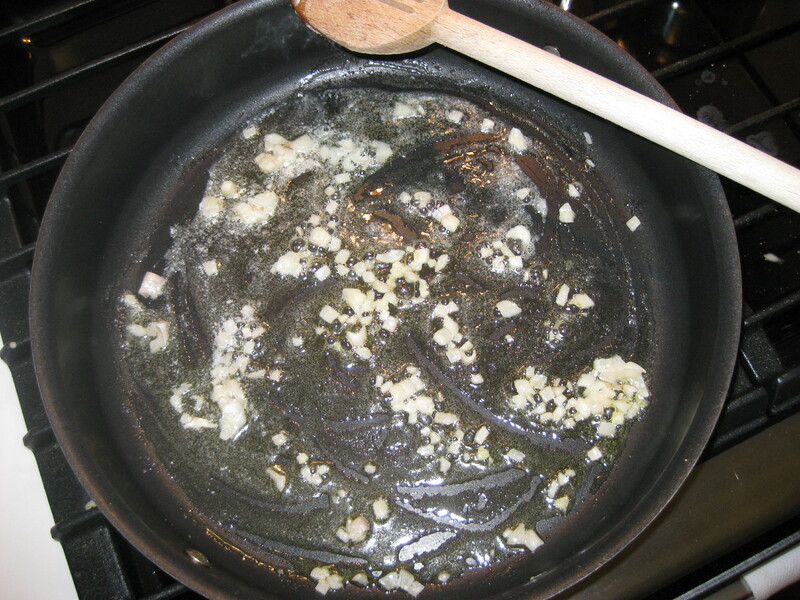 (Mornay Sauce Recipe) Put the remaining mornay sauce in a sauce pan over low heat. Sometimes you base an outfit on the shoes you want to wear. Sometimes a meal is built around the lure of one amazing herb. 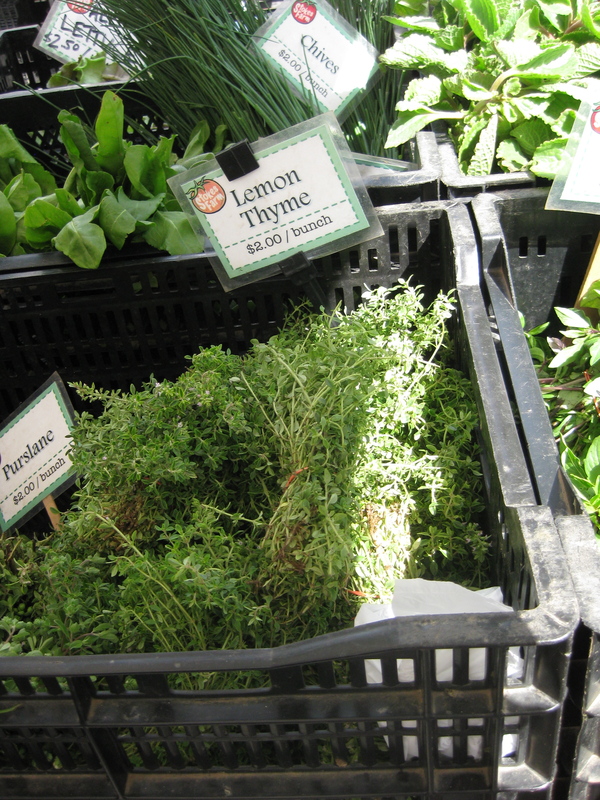 Bright, fresh lemon thyme is my new favorite herb and my current kitchen obsession. In addition to its incredible aroma and flavor, I’m totally getting smarter. Oh my darlin’ lemon thyme.